Fad Diet Book Bestsellers for Weight Loss: Buy or Skip? It seems like every couple of months a new book comes out about a new diet plan for weight loss and shoots to the top of the bestseller list. I decided to check and see what which fad diets are currently topping the list and give you the positives and negatives of them. Of the top eight books, three were related to Whole30 and four were based around the Ketogenic Diet. 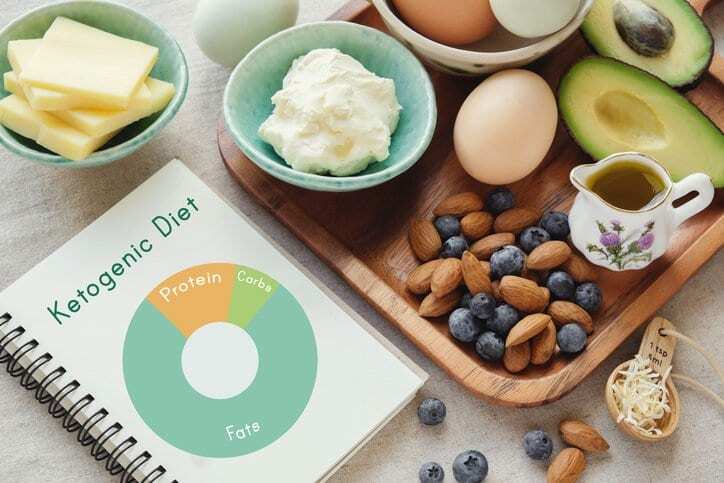 This diet plan cuts out all carbs except a very low 20 grams per day, and focuses on a high-fat diet. Doing this allows your body to enter ketosis, where it is breaking down dietary and stored body fat into ketones. The body will now focus on using fat for energy instead of sugar, which is what it normally uses. Protein intake is also lower than traditional low-carb diets to really focus on getting around 75% of your diet from fat. This diet plan eliminates all sugar (real and artificial), alcohol, grains, legumes, dairy, baked goods, junk food and treats (even if they are made with approved ingredients); and no stepping on the scale or taking body measurements for 30 days. You are encouraged to eat real food, specifically meat, seafood, and eggs and lots of fruits and veggies with herbs and seasonings. Pros: Focuses on real food, so you don’t have to buy special foods and instead can buy everything you need at the grocery store. Encourages healthy fats, lean protein, and lots of fresh fruits and vegetables. Helps to eliminate processed and packaged foods and makes you focus on fresh foods. Discourages replacing junk food with “healthier junk food” made with approved ingredients and encourages no junk food at all. Negatives: When you eliminate entire food groups such as grains and dairy, you are more likely to be at risk of vitamin and mineral deficiencies, specifically calcium, Vitamin D, and B Vitamins. If you are choosing non-lean meats, you can be taking in high levels of saturated fat, which will affect your cholesterol. Your fiber levels will decrease when eliminating all grains and legumes (beans). A diet this strict is challenging to maintain long term and may cause rapid weight loss followed by weight gain, which is called yo-yo dieting and has been found to slow down the metabolism and makes losing weight in the future more challenging. If you aren’t used to preparing all of your meals and snacks at home, this will add a lot of time to your typical routine. If you want to try something new and popular, keep in mind that these diets might not be the best long-term solution due to their strict rules. Both options have some positive aspects about them that can be incorporated into your diet. It never hurts to try something new when the end result is to increase your overall health. Now it’s up to you if you want to spend the money to buy the books and read more! This blog was written by Angie Mitchell, RD, Wellness Coordinator. To find out more about the NIFS bloggers, click here. YES — You Can Lose Weight Without “Starving”!